April 10th, 2008 : Sunny and Warm, Water Temp 57* and Clear. Picked clients up at 6am and went and caught bait. Set up on a midlake flat pulling 10 boards, a bobber and a couple downlines. After pulling about 150 yards I told the guys this doesn't look good , we should have been bit at least 4 or 5 times already. We went another 100 yards and caught a catfish and that confirmed my fears, it would be a slow day. Went 50 more yards and 2 boards hooked up and one downline hooked up and we boated all 3. Pulled a little further with no luck and turned back to hit the area where we caught the fish. Had a strike but it did not hook up . Worked the flat for a couple of hours on catching a couple more. I had 2 other friends fishing today , one catching 3 Stripers and a Walleye and the other catching only 2 Crappie all day. We changed patterns and worked different depths the rest of the day with only a couple more strikes. 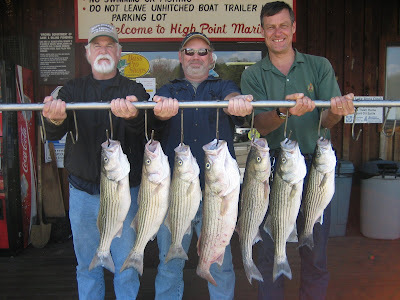 Today we had about 15 hits and boated 7 Stripers.